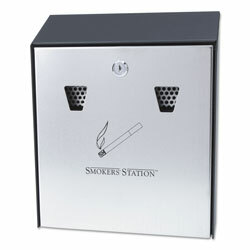 Rubbermaid Smokers' Station® Wall Urn. Weather-resistant galvanized steel body with black, textured powder coated finish and stainless steel door for outdoor use. Two disposal openings have stainless steel extinguishing screen and fire-safe galvanized steel inner liner. Keyed cam-lock front opens completely for easy emptying. Two keys and wall mounting hardware included. Minimum 30% recycled steel, 100% recyclable. 10w x 3d x 121/2h. Shpg. wt. 7-lbs. Smoking Receptacles from Rubbermaid! 192 In Stock today.